Although our April in Vermont has been kind of back and forth, (ice out at Joe's Pond was the earliest ever) overall it appears that Spring has arrived. Wikipedia says about April, "The traditional etymology is from the Latin aperire, "to open," in allusion to its being the season when trees and flowers begin to "open," which is supported by comparison with the modern Greek use of ἁνοιξις (opening) for spring." Yes. 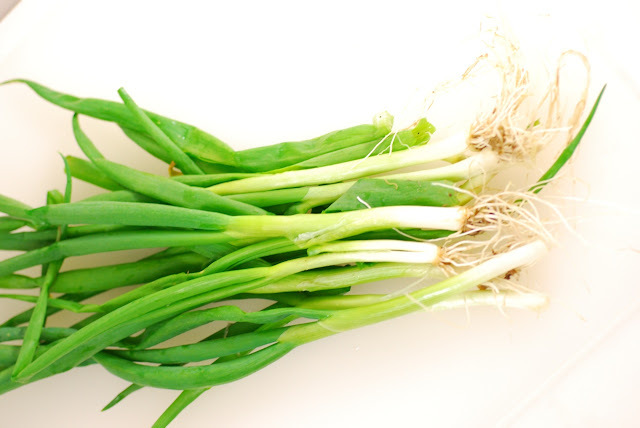 I noticed that down at the vegetable garden, where my bunching green onions have once again amazed me. This has to be the best vegetable ever; takes care of itself, keeps coming back and multiplying, shows up very early, and keeps providing until covered with snow. In the early Spring, these onions are very tender and delicate. I decided to make a fresh, Spring soup, with early green vegetables as a focus. 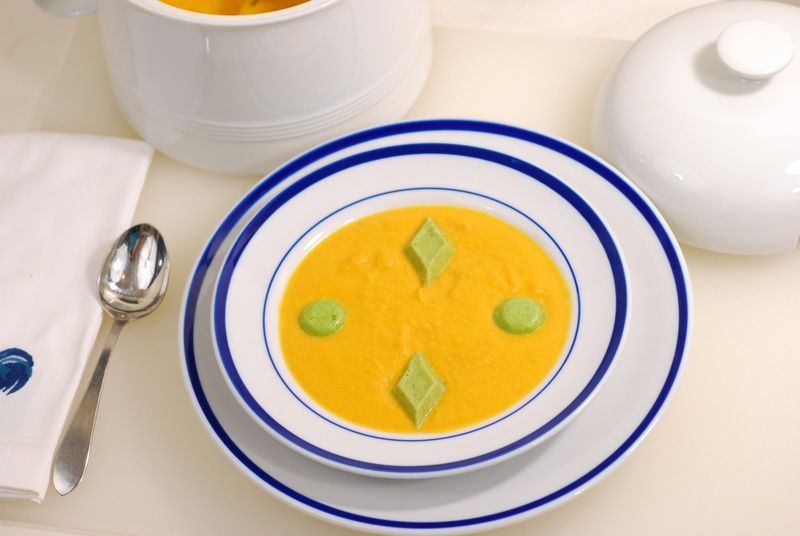 This soup combines carrots with parsnips to lighten and balance the flavor, in a chicken stock base with cream finish. 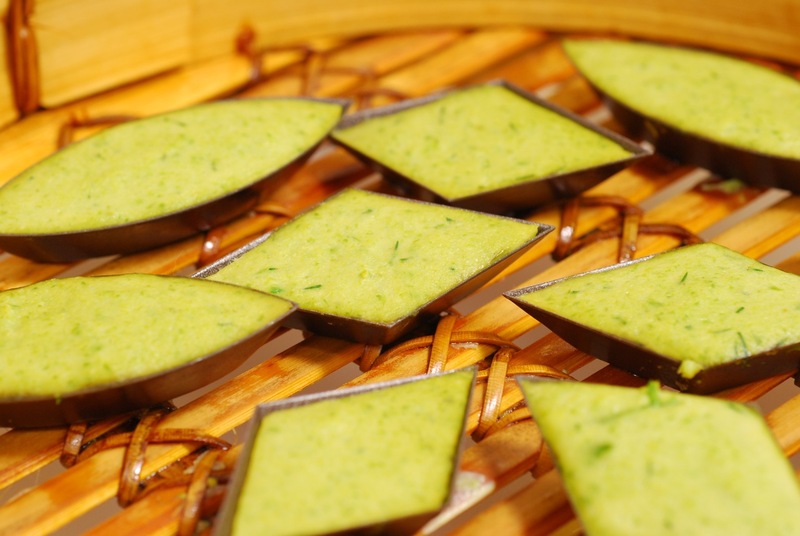 It is garnished with two kinds of steamed vegetable quenelles: Asparagus/Dill and Scallion/Ginger. 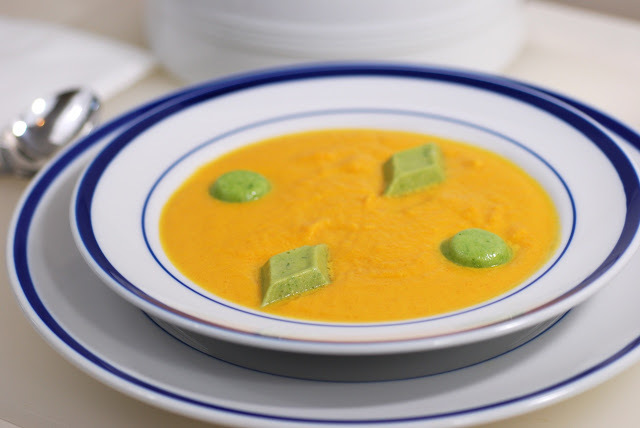 Using the green vegetables this way lets you enjoy a mouthful of separate, complementary flavor along with the bisque. 6 young green onions, cleaned, roots trimmed off, cut into 3" pieces, white parts split. 1. Gently Saute the chopped leek in the unsalted butter until tender, around 20 minutes. 2. Add the chicken stock and slowly reduce to 2 cups. Strain through chinois into a soup pot, pressing the liquid out. 3. Chop the carrots and parsnips to 1/4" approximately, add to the reduced stock. 4. Bring to boil and then simmer until vegetables are tender, about 30 minutes. Test for doneness. 5. Add the ginger root to the pot, then pour into the food processor bowl. 5. Puree the hot mixture in food processor until very smooth, at least 1 minute. 6. Finishing the soup: Put the pureed soup back in the pot. Add the cream, white pepper, and a teaspoon of salt. Simmer for 10 minutes. If soup is too thick, add more stock and cream at a 1:1 ratio. 7. Stir in the teaspoon of Sambuca, and taste. Adjust salt and white pepper at this point. 8. Keep warm while finishing the quenelles. 1. Simmer the Cauliflower in the water until tender. Drain. 2. 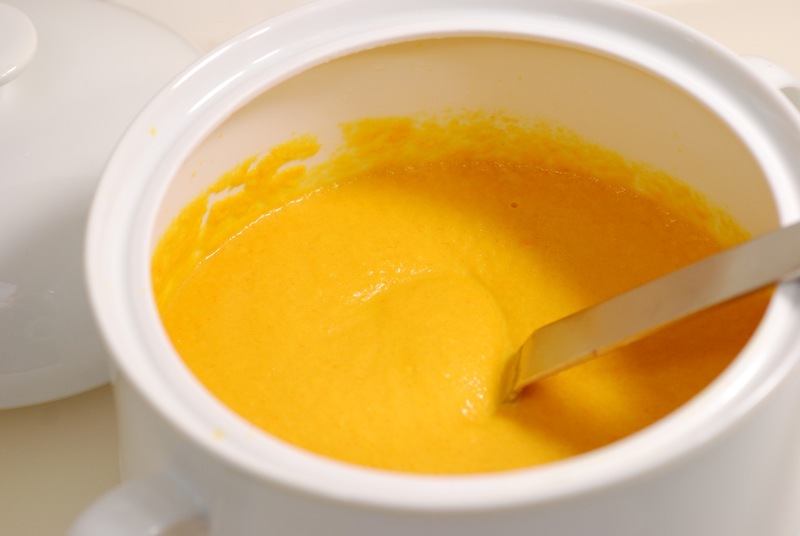 Puree the cooked Cauliflower in food processor until very smooth; Add the eggs and blend in. 3. In a saute pan, melt the butter, add the flour and corn starch, stirring until blended. While over low heat, whisk in the cream. 4. Add the cooked mixture to the Cauliflower in the food processor, blend until smooth. 5. Remove to a small bowl, for use in the flavors below. 1. Simmer the asparagus in the water until tender; drain. Rub off any loose membrane on the outside. 3. Place in the cleaned food processor bowl. 4. Add the dill, egg, corn starch, 4 T Quenelle Base (above), and salt. Blend. 5. Remove to a clean bowl. This is now ready to form and steam. 1. Simmer the green onions in the water until tender; drain. 2. Place in the cleaned food processor bowl. 3. Add the ginger root, egg, corn starch, 4 T Quenelle Base (above), and salt. Blend. 4. Remove to a clean bowl. This is now ready to form and steam. 1. 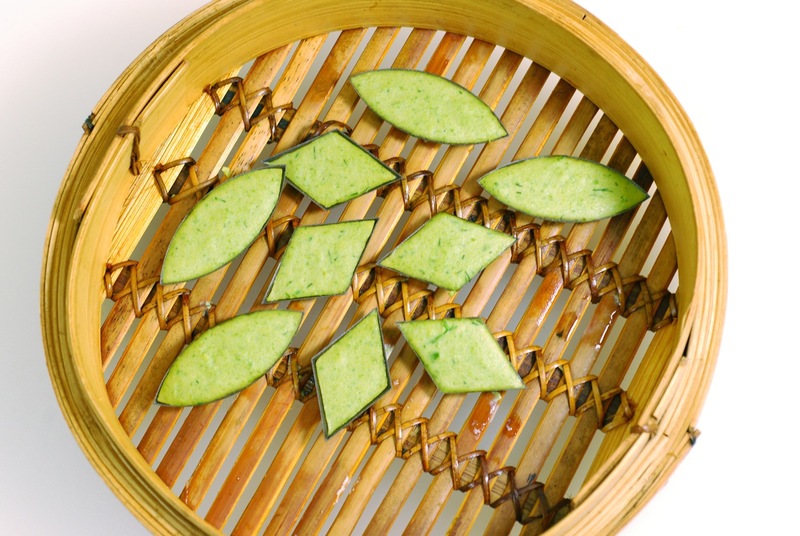 Set a bamboo steamer with lid over a suitable pot of gently boiling water. Preheat for 5 minutes. 2. Make a test quenelle of each flavor. (Testing is necessary because of the variability of the vegetables): lightly spray a tartlet form with cooking spray. Fill 3/4 full with flavored mixture. Place in steamer and cover; cook for 5 minutes (for small forms) or 10 minutes (for larger forms) and test. If the quenelle is not setting, stir 1/2 a beaten egg and 1 T corn starch into your mixture and try again. 3. Taste the finished quenelle, and adjust seasoning if needed. 4. Proceed to steam all of the quenelles, assigning shapes to flavors as you like. For each round, lightly spray the tartlet form with cooking spray before filling. The steamer may have two layers, and you can use both of them for steaming at the same time, lid on the top. 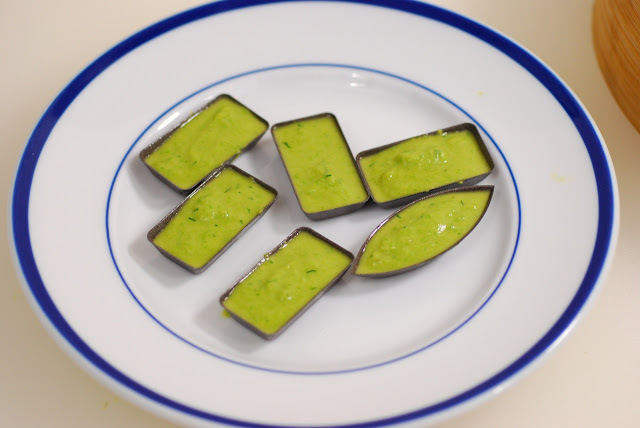 The quenelles will puff slightly, and loosen from the forms. 5. Unmold the quenelles onto a lightly buttered warm plate, cover loosely and hold until all are done. Taste soup again and adjust seasoning. Plate the soup with several quenelles of alternating shapes and flavors floating on the surface. Serve with fresh bread, salad, and a light white wine. Sue - found you through Weekend Cook and Tell on Serious Eats. I'm lemonfair on SE, but Kathy when I blog at Vermont Food and Garden here. I've been a Vermonter most of my life, but I'm stumped about what to say about it, so I haven't done a complete profile yet. If that's your land on the banner then yes, you did find paradise.